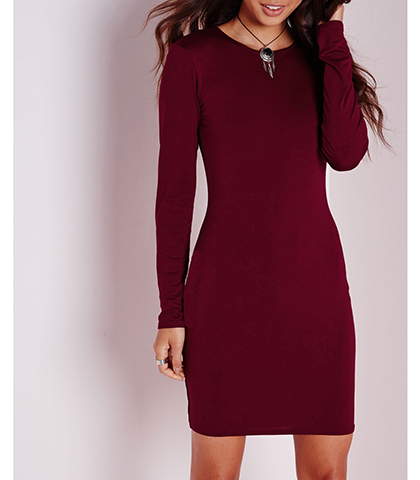 Waist N/A 24.5" 26" 28" 29.5"
Hip Size N/A 34.5" 36" 37.5" 39"
Length N/A 33" 33.5" 33.5" 34"
Lovely burgundy is the color choice for this fine bodycon dress which clings to your curves like a second skin, hugging your derriere with firm support. The fitted sleeves conform to your slender arms; complement the overall design of this finely stitched dress. A great attention to fit and style went into the creation of this fine garment which is suitable for work, an after work function or a night out. Wear your favorite pair of matching high heels and accessorize with a leather handbag for a professional look. Small size; bust 83 cm, waist 62 cm, sleeve length 82 cm, total length 87 cm.